You may remember my post about Regal, the jumping bean thoroughbred from Gettysburg. 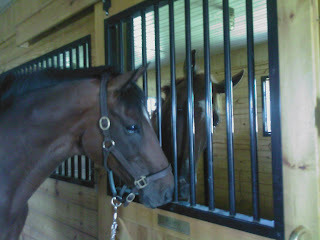 Well, who do you suppose lives at Riley's new barn? On the right you see Riley and Regal meeting for the first time -- instant friends, no posturing, but then they have a lot in common. I've never seen Regal look better, he's in good weight and fit as a fiddle. For a horse on stall rest, Riley looks pretty relaxed and happy. The barn manager assures me he is good for his morning hand walk and for foot bandaging (which they do 4 times a week). He does a beautiful job duct-taping a foot, it's downright artistic. I tried to take a picture but it came out too dark. It's like something from an episode on Project Runway--hand this guy a roll of duct tape and he'll turn it into a silver hoof sculpture. Beautiful! Regal is quite a handsome fellow and the care at the new barn sounds impeccable. Riley may get to be a bit more of a handful as time goes on. Some do, some don't, but wonderful you have capable people to handle him for you. Isn't duct tape the greatest invention ever...well, that might be a bit of an exaggeration, but what a good addition to any tack box. Duct tape artisty can earn some great rewards. One of my students had a duct tape pair of shorts on the last day of school. Apparently, they have prom contests for kids to design duct tape outfits. Where is the plaster of paris when you need it?? ?